Have you ever wanted to go behind the scenes and visit a working artists studio? A few weeks ago I was invited for a studio tour at the home of artist Sheryl Budnik. 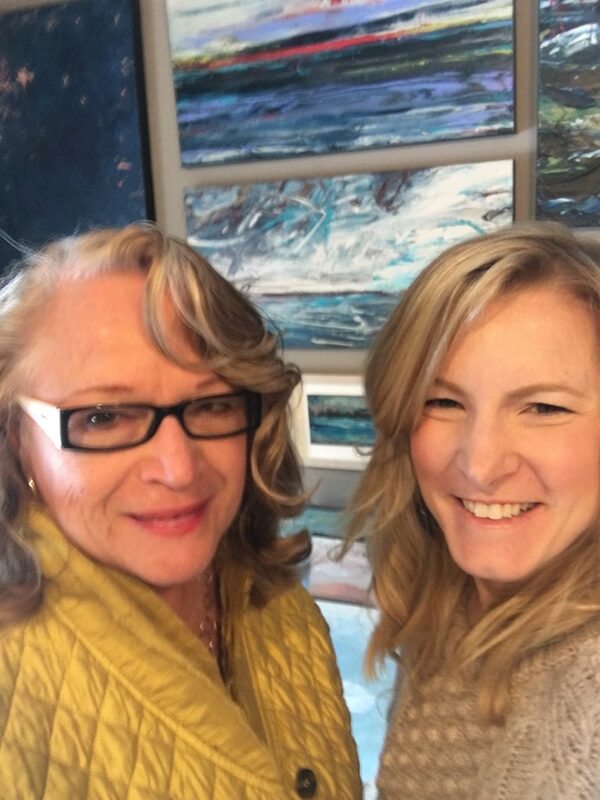 Sheryl is a talented oil painter and I love her creations! Of course I love to see where people live and work, how they make their own spaces beautiful and what inspires them. Many of Sheryl’s paintings are about water and the Great Lakes, one of my favorite topics. I am naturally drawn to art that emulates light, reflectivity and abstract views of nature. Her work captures all those elements and beyond! Sheryl’s studio is so inspiring! The process creatives use for collecting inspiration and cataloging it absolutely fascinates me. To see some of Sheryl’s most recent work stop by the Emerge show in the Morton House downtown Grand Rapids. She also has a couple pieces in the Collectors Show Spring 2018. On the topic of color, if you missed my segment Your Home By Design on The WGVU Morning Show with Shelley Irwin a few weeks ago, we had guest Deb DeGraaf on to talk color personalities and trends. Here Amanda Rogalski caught us all doing our typical post show selfie! Grab your ear buds and Listen Here. We look like we could be sisters, ha! Despite the snow, spring is here and in our office we are taking beauty by the reigns! Don’t let this short cold snap bring you down, get out to the galleries, have friends over for a glass of wine or plan one more warm weather vacation. We are in the home stretch to a spring awakening, so wash those eyes with beauty!